As I have mentioned before, I love peels. Any kind of chemical or physical peels. But I really am a sucker for a good chemical peel. 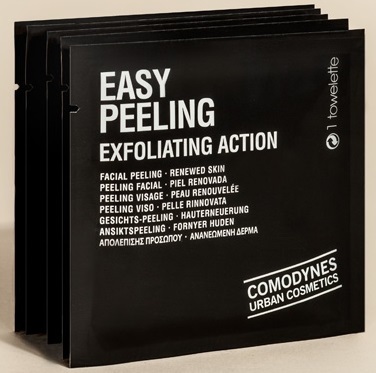 I was given these peel towelettes to try out and from a company called Comodynes, which is a European cosmetic and skincare company that is now selling online and has some amazing skincare products. I tried out their Easy Peeling Exfoliating Action Individual Towelettes. Compared to other products that are similar in nature, these compare favorably and quite well. With these towelettes you can achieve smooth and even skin with the exfoliating facial towelette that deeply cleanses pores (hair follicles) and eliminates dead skin cells, leaving skin free to breathe. Features a double exfoliating action, both mechanical and biological. Mechanical exfoliation as a result of the micro-spheres impregnated into the fabric of the towelette, and the latter due to its formula which contain biological assets that stimulate cell renewal. The single dose sizing is perfectly suited to fit into cosmetic cases, purses or bags and is perfect for travel. There are no more excuses about not being able to exfoliate and do a mild peel. It takes 1 minute to apply and complete the application process. These can be used once or twice a week for best results. They come in a pack of 8 towelettes. If you look at the ingredients you may think, am I getting a good peeling here? But yes you are. It contains a poly hydroxy acid along with witch hazel, which boosts the power of the poly hydroxy acid. The towelette has microspheres on it for an in-depth exfoliation and ingredients that promote cell stimulation and regeneration. The use of the towelette maximizes the results of treatments applied afterwards, such as moisturizers or self-tanners, because impurities are eliminated and this allows for deeper penetration of active ingredients. The practical and compact single-dose format means that you can use the treatment any time, any place. These are good for all skin types. Even sensitive skins can use this, I would do a patch test first like I would anything else. I would especially recommend this product for dry, normal, combination and oily skins. I would not recommend this for skins with pustules. Mature skins would benefit nicely as long as it is tolerated. To use, apply towelette to entire face, neck and décoletté and keep applying until towelette is dry. The entire process should take about 1 minute. Do not rinse off. Make sure to avoid contact with eyes. I found these to be very effective. I had no problems with them and used them according to the directions. My skin felt softer after using them and definitely looked brighter and had less problems with acne. I would recommend these to anyone who wants to lightly exfoliate their skin and get rid of extraneous skin cells and help fight off light acne, hyperpigmentation and uneven skin tone. Comodynes Easy Peeling Exfoliating Individual Towelettes retail for 9.34€. They can be purchased online at www.comodynes.com. They have lots of other products too. Like Comodynes on Facebook: https://www.facebook.com/comodynes; Follow Comodynes on Twitter: @Comodynes_Es; Follow Comodynes on Instagram: https://instagram.com/Comodynes_Es and Subscribe to Comodynes on YouTube: https://www.youtube.com/user/ComodynesYT.